D.C. Mayor Adrian M. Fenty and attorney general Linda Singer, in their petition to the Supreme Court and in a Washington Post op-ed ("Fighting for Our Handgun Ban," September 4), raise four arguments in support of the city's ban. Their first argument is that the Second Amendment ensures only that members of state militias are properly armed, not that private citizens can have guns for self-defense and other personal uses. That contentious question has been debated at length on these pages. See Dennis Henigan, "The Mythic Second," March 26, 2007; and Robert A. Levy, "Thanks to the Second Amendment," April 16, 2007. The city's remaining three arguments — two legal claims and one policy claim — have received comparatively less attention. First, declares the mayor, even if the Second Amendment protects private ownership of firearms for non-militia purposes, a ban on all handguns is reasonable because D.C. allows possession of rifles and shotguns in the home. Second, the Amendment restricts the actions of the federal government, but not the states, and D.C. should be treated the same as a state for Second Amendment purposes. And third, "handgun bans work"; the streets of the Nation's Capital are safer as a result. Let's consider each argument in turn. ...sounds like one of the new Bruce Springsteen songs, doesn't it? Did I ever mention I had a profound romantic hand-holding moment at a BS concert back when the Boss still played small rooms, and years and years later I read about it in Vanity Fair? I'm glad it was good for her, too. Yes! My memories have just been sold! Anyhow, I'm so friggin' swamped I can't believe it. Am on the way to the IDPA Nationals in Allentown this Friday — if you're shooting, stop by and say Hi-Dee Ho! Then two trips next week. Then another profound romantic moment, this time a whole weekend with my Sweetie in Santa Fe and Taos. Forget that Springsteen concert crap...this is the Real Thing! With world class Mexican food to boot! The reason I'm behind is the USFS Greenies keep taking up more of my time. I can't go into the whole thing now, but you guys will absolutely be stunned at their latest escapades...really, I can't make this stuff up! Tomorrow we drop some registered letters on big time D.C. desktops, which ought to be like smacking the hornet's nest with a big ole Louisville Slugger...I'll keep you posted. I may also need you to provide cover fire, as I continue to Win Friends and Influence People! Had a wonderful lunch with Stephen Hunter today at the ever-ritzy Brown Palace Hotel in Denver. We talked guns, guns and more guns, and a little bit about swords. At last night's reading from the 47th Samurai, which is officially on all the best-sellers' lists now, my Sweetie sat next to me and whispered in my ear, "No swords! No! No! No!" Steve gave unequivocally the most eloquent, more reasoned description of being a "gun guy" that I have ever heard. I especially like the way the People's Republic of Boulder crowd started tensing up, especially when he said his favorite reading materials are gun magazines. Thanks, brother! Continuing from the last post, if I had the access to the current crop of politicians, what would I ask them? I've actually bee thinking about this over the weekend, and I realized that we need a "litmus test" for politicians looking for our vote. Politicians hate litmus tests, because they strip away the wiggle room...a good litmus test requires either a "yes" or "no" answer. Pundits hate litmus tests because they refuse to believe that the complex process of selecting a candidate can be boiled down to "yes" or "no" answers. I say, why not? In the field of armed self-defense, we routinely look at making life-or-death decisions in seconds or even fractions of a second. Malcom Gladwell's great little book Blink outlines just how fast we can make decisions. So, what are our questions for the litmus test? First, let me tell you what our questions aren't. For instance, "do you believe in the individual interpretation of the Second Amendment?" is far too broad a question with 'way too much wiggle room for a politico. They can say, for example, that they unequivocally believe in the individual interpretation, which of course does allow for "reasonable regulation" of firearms. One person's "reasonable" is another person's "totalitarian state." Litmus tests need to be specific to smoke out the politican's real beliefs, insofar as a politician has any real beliefs. Ideally, the litmus test should also commit the politician to a specific course of action, esentially provide a way for we lowly citizens to keep score. All questions are to be answered "yes" or "no." 1) If you are elected President, do you agree to unconditionally oppose up to and including a Presidential veto any and all legislation promulgating lawsuits aimed at bankrupting or placing unwarranted restrictions on the firearms industry? 2) If you are elected President. do you agree to unconditionally oppose up to and including a Presidential veto any legislation aimed at banning or limiting citizens' access to specific weapons, including so-called "assault" weapons? 3) If you are elected President, do you agree to unconditionally support, including signing into law if it is passed by Congress, legislation providing that every person in America who is not prohibited from owning a firearm has a right to carry a firearm regardless of state or local prohibitions? There! That wasn't so hard, was it? Remember, "let me explain" is not an acceptable answer; "let me explain" is poltician-speak for "no." ...sigh...it's cold and raining, the clouds hanging down low in the mountains. OTOH, I didn't do anything yesterday except put in a little time on the overhaul of my gun room, which I anticipate being finished in time for the next AWB. RE: Politics and politicos...I wish I did have the juice to bring the Presidential hopefuls to the table and talk to them directly. If I am nothing else, I am a world-class interviewer with the credits to back that statement up, and as usualk, I have a few questions. I recall when I sat down with candidate Jimmy Carter, whom I was predisposed to at least respect; I walked away from that table both repulsed and horrified that this man might actually be elected. And like a bad yeast infection, he's still with us. The simple truth, however, is that I lack the juice to pull such a thing off. Part of the problem is, of course, me...I play hard and I only play to win. I'm not big on compromise, unless it buys us something. As regular readers of this blog know, I am not prone to euphemism. A lifelong professional journalist, I accepted long ago that I would not be on many people's Christmas card list. The other reason lies in the industry itself, hidden in the closing words of Rudy Giulaini...if not me, who? Industrywise, we're sort of — to borrow a phrase from NYPD's Sipowitz — the town punch...we'll give it up for anyone who even pretends to like us. Republicans are better at pretending to like us than Democrats (with a few exceptions). But the operative word remains "pretending." His remarks at the National Rifle Association's "Celebration of American Values" conference left many members uneasy, especially after Giuliani struggled to answer questions about whether he still thinks gun-makers should be held liable for criminals' actions. Hey, the problemo is that Rudy is every bit as antigun as the Hillary/Osama Democratic ticket, except that as I have been pointing out now for the last two years, the Republicans do not have a snowball's chance in Phoenix if we — the gun culture — stay home. I would feel much more warm and fuzzy about this if the Republicans had noticed that we matter back when they still swung a big stick. John "Close the Gunshow Loophole" McCain sounding like a Second Amendment stump preacher; Mitt "No Duck in Americais Safe from my, er, Shotgun" Romney; Rudy "New Yorkers are Too Freakin' Stupid to Have Guns" Giuliani...sigh. Fred Thompson strolled into the National Rifle Association yesterday firing shots at his GOP presidential rivals, but he also took aim at Bill and Hillary Clinton. Introducing his young, blond wife, the former "Law & Order" star said: "She would make a much better looking first lady than Bill Clinton." The crowd of influential conservatives roared with laughter and applause as Thompson, sounding like the sheriff in an old Western, spoke passionately about God and guns. "My relationship with you folks can be summed up very shortly," he began. "Check the record." One argument Giuliani makes is that different gun laws are needed for New York City than, say, South Carolina. Thompson shot that down, saying, "My philosophy does not depend upon my geography." The first question Thompson got from the audience after the speech was whether gun rights should be different in New York than elsewhere. It's a bit late in the game for the Republicans to once again notice that the crazy uncle in the closet — that woud be "us" — is the difference between winning and losing. Is there anyone on our side with an IQ higher than boiling water who believes for one minute that Rudy would not sign a new AWB? Is there anybody who actually believes that that Mitt Romney has had some sort of epiphany and thinks that we're anything but an undisciplined pack of backwoods peckerwoods? WASHINGTON (AP) - Republican Rudy Giuliani sought to reassure the National Rifle Association of his support for a constitutional right to bear arms as rivals Fred Thompson and John McCain focused on the former New York mayor's past calls for tough gun control. "I'd like us to respect each other; I think we have very, very legitimate and mostly similar views," Giuliani told NRA members who clapped politely a dozen times during his 20-minute speech. The audience of about 500 people gave a warmer reception to Thompson, the former Tennessee senator who announced his campaign this month. Some stood and cheered as Thompson said: "Our basic rights come from God, not from government." "I've never subscribed to the notion that we made our country safer by infringing on the Second Amendment rights of law-abiding citizens," Thompson said. And he reminded the group he has supported them consistently since the year he was elected senator. "It's not just a matter of promises made, as far as I'm concerned. It's a matter of commitments that have been kept," he said in a veiled swipe at Giuliani. The candidates addressed the NRA event as gun violence occurred on a college campus. Two students were shot and wounded, one seriously, at Delaware State University, and the campus was locked down as police searched for a gunman, according to officials. McCain criticized Giuliani outright, describing the former mayor's "devious attempt to bankrupt gun manufacturers" with a lawsuit against them over violent crimes involving guns. A federal court heard arguments on the ongoing lawsuit Friday in New York. The Arizona senator also mentioned Giuliani's use of the word "extremists" in talking about the NRA. "My friends, gun owners are not extremists; you are the core of modern America," McCain said. "The Second Amendment is unique in the world and at the core of our constitutional freedoms. It guarantees an individual right to keep and bear arms. To argue anything else is to reject the clear meaning of our founding fathers. Yeah, well. Giuliani probably pegged it when he said later that it was all about electability, in other words, him or the Hillary-beast. Here's a link to Fred cracking wise about Bill Clinton...I wish Fred would run a little harder...at least work up a sweat...I still have faith. I'm gone for a week, and all of a sudden it's fall...the aspen have gone golden in clusters...the ground cover is red...our local lion snarfed another horse and a "domestic animal," as the papers says, then lay around a driveway in the sun, causing the wildlife guys to set traps...I say stake out a "sacrificial goat," a member of the town council or the mayor will work well...of course, the intent is to catch the lion, not gag it to death...we're having our own local Oktoberfest here in Nederland, and I will be pouring beer from 10:30 AM to 3 PM...drop by and give me a shout! US Forest Service green ugliness continues unabated...a friend of mine went up to the posted Magnolia range — the very range that triggered the national outcry and resulted in a national Memorandum of Understanding between the shooting industry and the USFS as wellas memoranda toevery USFS head explaining that recreatinal shooting is an accepted use of the resource and that REMAINS CLOSED — and put 100 rounds through his Glock. Since he's a firefighter, he carried his radio and heard this whole ridiculous exchange. First telephone calls began pouring into the local police department, city hall (such as it is). The local cops didn't respond because the shooting was not taking place on town land and they had no jurisdiction. They, however, notified the Boulder County Sheriff's Department, who quickly sent numerous cars to scene. However, before the county cars could get there, a call went out cancelling the call, the dispatchers saying that they had a memo stating RECREATIONAL SHOOTING IS LEGAL ON ALL FOREST SERVICE LAND. 1) Our sources in local law enforcement tell us that the antigun activists at the local branch of the USFS refuse to acept defeat and will soon post the range for a different reason, such as "shooting is not allowed when the sun is visible," then claim that because the property was illegally posted before the MOU and the memorandum from Washington, the posting is "grandfathered in" and therefore does not require a hearing and public input from shooters. 2) All these telephone calls complaining about the shooting are coming from basically ONE person, a woman antigun activist who is committed to stopping shooting wherever she can. ONE — count 'em — PERSON, who is constantly badgering the Town of Nederland, all the local police departments, the USFS...and all of them are dancing to her antigun tune. Here's the punch line...HER phone number isn't listed. 3) USFS officials are having a big meeting in November to discuss recreational shooting. I, of course, am pointedly not invited so will certainly be attending. I think this time I'll be attending with a video camera, so everyone will have the opportunity to put names with public utterances. Since it'll be a public meeting, I think names, addresses and phone numbers of all the participants would be a good thing...it's past time to scare the rats out from under the rocks, doncha think? Well, it's still great to be home, even with all the local angst. I should have gone to the NRA event in D.C. with the Presidential hopefuls, but I couldn't face a trip between trips. 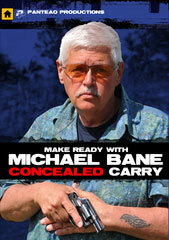 I will be at the IDPA Nationals in PA next week — drop by; say hi of course. After a long and brave fight with amyloidosis, international bestselling fantasy author Robert Jordan (born James Oliver Rigney, Jr.) passed on Sunday afternoon. Jordan's Wheel of Time series had spawned a legion of fans, along with music, websites, and all of the other trappings that come from the kind of success in which an author's imagination transfers itself to his fans. Jordan had first disclosed his condition through a letter posted on Locus Online and elsewhere in March 2006. In it, he had expressed his determination to beat the disease: "I have thirty more years' worth of books to write even if I can keep from thinking of any more, and I don't intend to let this thing get in my way." Jordan's honest and open approach about his condition helped bring needed attention to amyloidosis, a rare blood disease. According to Wikipedia and his publisher bio, Jordan was born in Charleston, South Carolina, and served two tours in Vietnam, earning the Distinguished Flying Cross with bronze oak leaf cluster, the Bronze Star with "V" and bronze oak leaf cluster, and two Vietnamese Gallantry Crosses with palm. He later received a degree in physics from The Citadel and worked for the U.S. Navy as a nuclear engineer. Jordan began writing in 1977 and was first published in 1980 with The Fallon Blood under the pen name Reagan O'Neal. He then cut his teeth on a series of Conan novels, before turning in the 1990s to the Wheel of Time novels that earned him his reputation. Jordan's heroic fantasy had a truly epic scope and his readership similarly transcended the fantasy genre. Over the years, I can recall hearing about Jordan from a multitude of people and settings--on racquetball courts, in shopping malls, at dinner parties, on boats, in pool halls, and in a number of different countries. The last book in the series was scheduled to come out this year. I went back and read the series in order, from the prequel, and I was once again struck by the incredible scope and vision of the series. I know what you're thinking—those little .22-inch-diameter bullets zipping right through walls—but ammunition technology has kept pace with the evolution of firearms. There are a host of low-penetration 5.56mm/.223 rounds for law-enforcement use and civilian self-defense, including my own choice, Hornady 55-grain TAPs. Mr. Bane says that TAP bullets are low penetration, while this article on PoliceOne.com by Jeff Chudwin refers to them as barrier penetrators! The author even says that soft point bullets are necessary for reduced penetration, not the "Hornaday TAP barrier penetrator". Who is right, Mr. Bane or Mr. Chudwin? I don't know for sure, but one of them has to be wrong. Whoever it is, their advice might just get someone killed when the load they chose on their recommendation doesn't perform as expected. It's not conflicting info...Hornady makes a whole LINE of TAP ammo, with different intended uses for the various offerrings. The 55-gr TAPS are designed for higher fragmentation and lower penetration. At least, that's what the Hornady reps told me, that's how the ammo is marketed and that's what several top SWAT and military trainers have told me. Hornady has been marketing a less-penetrative 5.56 tactical round for at least 5 years. RE: Rifles/carbines as self-defense options in urban scenarios...never said that one size fits all. I do think that most people don't have the slightest idea of how penetrative a specific cartridge actually is. A few years back, I did some penetration tests on various 9mm ammo though standard wall-type material that scared the crap out of me. Bill Murphy makes a point in his GUNSITE shotgun class that all types of buckshot are much more penetrative than many people think (and moreso than many handgun and some rifle rounds)...and buckshot often gets recommended as a good "urban" self-defense load! Here's the pop quiz...for an apartment dweller, is the best option a 9mm Glock, a Marlin Camp Carbine in .40 S&W, a 12-gauge Remington 870 or a Taurus "Judge" loaded with .410 shot? The answer is "maybe"...can't answer without more info...the experience and skill level of the apartment dweller, the construction of the apartment itself, the threat level, the ammo, etc. 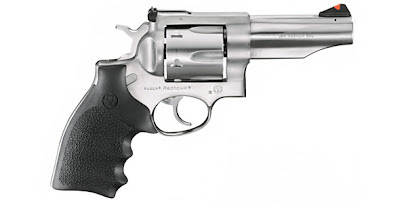 If I was ramping someone up from zero, I'd go for the revolver; I'd probably end up with a "progressive" cylinder loading something like shot (#4); shot (#4); followed by 3 .45 Colt; Glaser Safety Slugs. Not ideal, but enough to get you through the night. Everyone's situation is different, a point I have emphasized again and again. Recommending firearms and/or ammunition is an inexact science. There are indeed substantial differences between credible people in many, many areas. Let me give you a "blunt trauma" example — the .30 Carbine cartridge out of an M1 Carbine...I have been told in excruciating detail by credible — credible being defined as people who used the round and the firearm in the field — LEOs and military that the .30 Carbine is a wildly overpenetrative largely ineffective round. I have also been told by equally credible LEOs and military that the .30 Carbine is the pure-D Hammer of Thor. In effect, both sides are correct — bullet performance is ultimately a chaos system, a singularity in which actual performance is based on quite literally thousands of individual factors, from the nature of shootee's clothing to his or her mental state at the time of the shooting. That means that simulated bullet performance is exactly that — simulated. I base my personal self-defense decisions on both my own experience, testing and evaluations and the experiences, testings and evaluations of people I respect. I do my best to open my decision-making processes to my viewers and to my readers (and I suppose with my podcasts to my "hearers"). Unfortunately, I have no "revealed truths," no marble tablets brought down from the mountain. I can tell you want I like, what I use and why. Beyond that, you have to make your own decisions. I am acutely aware that that I am talking about issues of life and death. I routinely get "you're going to get someone killed, you irresponsible fool" notes from people who either dislike things I like, like things I don't or just don't agree with me. I have already received viciously offensive emails based on James' imminently reasonable post on this blog (and his posted question on my blog), which I hope I have answered fairly. Not your fault, James!!!!! Just comes with the territory. My personal favorite is the one who said he would have posted his remarks on my blog, but couldn't find it. I guess my marketing needs work...although I did type "GOOGLE," then "MICHAEL BANE BLOG" and, well, there I was...in 18 of 20 of the first Google entries...darn...I was hoping for a grand slam! Keep up the great work, James, and I appreciate your occasional comments on my blog! Indeed it is. Perhaps, today, we are meant to live in these times. Perhaps right here, right now, we are meant to be tested. Maybe we are meant to have faith that other forces are at work in this world, that we are meant to rediscover our strength and our survival skills. And so the question: can we, the people of the West, be brought to failure despite our enormous cultural and spiritual legacy? Three thousand years of history look down upon us: does this generation wish to be remembered for not having had the strength to look danger squarely in the eye? For having failed to harness our latent strength in our own defense? I didn't even know it ever rained in southern Arizona! It was quick, but it was definitely water. learn something new every day. Am still out on the Grind Trip, just past the half-way mark. Tomorrow I spend the day with cowboy poet Baxter Black, which I fully expect to be entertaining. Then we concentrate on Old West gunfights, which are cool. Since we were filming a SHOOTING GALLERY on revolvers, I've been carrying a Charter Arms Bulldog .44 Special in a Simply Rugged Sourdough Pancake holster...a great little holster for all-day carry fo a nasty little gun...sort of the blunt trauma equivalent of a pocket pistol. Sorry guys...today was just a friggin' grind...even on the range, there was nothing fun about it. I profoundly hope tomorrow will be better, or at least slightly more upbeat. Pepperberg bought Alex from an animal shop in 1973, the parrot learned enough English to identify 50 different objects, seven colors, and five shapes. He could count up to six, including zero, was able to express desires, including his frustration with the repetitive research. He also occasionally instructed two other parrots at the lab to "talk better" if they mumbled, though it wasn't clear if he was simply mimicking researchers. Pepperberg said Alex hadn't reached his full cognitive potential and was demonstrating the ability to take distinct sounds from words he knew and combine them to form new words. Just last month he pronounced the word "seven" for the first time. I was lucky enough to meet Dr. Pepperberg and hear her talk about Alex. As one of her researchers said to me, off the record, if primate researchers had gotten the results Dr. Pepperberg had gotten with Alex and her other Grey Parrots, people would be ringing bells in churches. 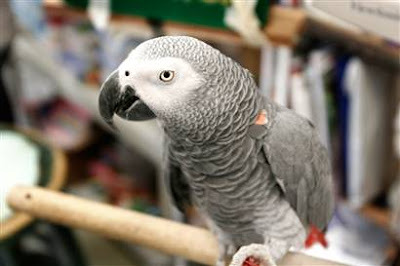 My interest, of course, comes from living 14 years with Ripley, my African Grey Parrot. I was never particularly interested in birds as pets — companions — until I read an article in Audubon Magazine on Dr. Pepperberg's research with Alex. It was fascinating...here was an animal who appeared to think. Dr. Pepperberg would never claim that, of course...researchers don't reach conclusions like that. But read The Alex Studies: Cognitive and Communicative Abilities of Grey Parrots, Dr. Pepperberg's book on her work, and make your own decision. I read everything I could on Grey Parrots, then my Sweetie and I made the big step and purchased an amazingly ugly (and expensive) chick, less than one week out of his egg, from a truly eclectic pet store in downtown Denver. We visited the chick, whom we named Ripley from the Aliens movies, twice a week until he was weaned, then we took him home. Most of our friends are thoroughly sick of Ripley stories...he has a huge vocabulary and speaks in context...that is, when he orders you to do something, he knows exactly what he is saying. As with Alex, he taught our second bird, a far less vocally gifted blue and gold macaw, Cleo, to properly pronounce words. If I tell him I'm going to be gone for three days, on the afternon of the third day he will ask my Sweetie, "Where's Michael?" He expects an answer. One quick Ripley story — when he was a baby, he was never raised around mirrors. In fact, the first mirror he ever saw was our bathroom mirror when we took him in for his first shower. The mirror stopped him dead...there was another bird! We knew from our reading that it took a baby chimp approximately six months to realize that the image in the mirror wasn't another chimp behind a clear pane of glass. Ripley started at the mirror, then leaned forward and tapped it with his beak a couple of times. He then pulled back and — I swear! — stuck out his right wing, then pulled it back in. He tapped the mirror again, then slowly extended his left wing, and pulled it back in. And he never paid attention to the mirror again. Through my parrots, and by extension, though Alex, I began to see animals differently. I shot my share of crows when I was growing up in Tennessee; but when I see the great mountain ravens that inhabit the high country with me, I see individuals that according to current studies rival Grey Parrots in intelligence and vocal abilities. I see a sentience, with memory, emotions and self-awareness. I wish I could see, however briefly, into their world. So I mourn the passing of Alex, a small grey bird with a questing intelligence, who let us see however briefly into his world. Pepperberg said the last time she saw Alex on Thursday, they went through their goodnight routine, in which she told him it was time to go in the cage and said: "You be good, I love you. I'll see you tomorrow." Alex responded, "You'll be in tomorrow." Today, September 11, I could exhort all of us to never forget, but we've already forgotten, haven't we? I could reach back into the sealed box that each of us has in the back of our head and take out my memories of Ground Zero, one week later, when the fires still burned and the air stank of seared steel and charred meat. Of the rows of 5-gallon plastic buckets that held...pieces...of my fellow citizens. Of standing in my best friend's looted apartment in haz-mat gear ankle-deep in ash — dangerous, as we were warned, because of it's "high organic content" — providing what comfort I could to a exhausted, sobbing NYPD SWAT cop. "We couldn't save anyone," more a prayer than a curse. "Goddamnit...goddamit...goddamit it all." Of the cold drizzle that leeched the colors from and ran the ink on the thousands of "Have You Seen..." or "Please CALL Us If You're Safe..." posters that covered every square inch of space in south Manhattan. But in the end, does it matter? Is it not easier for us as a culture to pretend that there aren't people who wish us dead? People who don't want our land, or our affluence, or our culture, or our freedom, but only wish to see us reduced to a gray ash of "high organic content," blown away by the winds of history. It's hard to hang onto painful thoughts in a bumper sticker culture, where "solutions" are only a few words away. "Out Now!" "Impeach the Bastards!" "Intolerance is Evil!" "You Cannot Have Peace When You Prepare For War!" "No More War!" Remembering is hard. I could tell you the consequences of not remembering, but I suspect you already know them. That is, of course, if you remember. Britney at the MTV Video Music Awards...it is nearly impossible to parody a joke. Anyway, first off, I've got to scrape some egg off my face. My Sweetie's bro, Mark, informs me thatyes, our local lion snatched a horse...but it was a miniature horse. So...a miniature lion? A tabby run wild? I interogated Pokke-san, our tailless Manx who is, in fact, a fierce mouser, but he swore he was at home lying on his back playing with a paperclip when the alleged assasination took place, and Alf the Wonder Beagle backs his alibi. In any case, I've downscaled the threat...I'm now carrying a Walther TPH in .22 long rifle. I AM READY! A man who robbed a South Richmond Baskin-Robbins ice-cream store with a fake gun Thursday night was shot to death by the store's gun-wielding manager. Well, there you are — evolution in action! BTW, last week I received a Walther P1 9mm, the alloy-framed version of the famous German P38 from WW2, from AIM Surplus. I was blown away by the quality of the gun...very, very nice! I got the P-1 as part of a series we'll be doing on DOWN RANGE on inexpensive — ne...cheap — handguns that will do the job for self-defense. Other of our inexpensive guns include the Star "Modelos Super" in 9mm Largo, the CZ-52 in 7.62 X 25 (which I'll probably refit to plain vanilla 9mm for expense-sake) and maybe one of the Hungarian or Czech 9mm Makarov pistols. I've always have a soft spot for the P38/P1 because they were the first semiautos I put a lot of rounds through. My father had a P38 and a P1 he'd bought mailorder (ie, before 1968), and when I was in my early teens I lobbed a lot of cheap 9mm surplus downrange through the German guns. I found them to be fiercely reliable and certainly as accurate as I was. I think the P38/P1s got a bad rap from the gunwriters of the time (just like the M1 Carbine and the .30 Carbine round, as we've discussed before) because of the whole comfy relationship between some of the greats and American gun companies. It was an unwritten rule that American product was pretty much beyond criticism, especially since the American firearms industry was ramping itself up after WW2. It was totally okay, however, to dis' the hardware of the Hated Hun. P38s were alleged to be unreliable, inaccurate, clunky, blah blah. Wasn't my experience. The P1 I got from AIM has excellent DA and SA trigger pulls, and I'm looking forward to taking it to the range. I was going to do that today, but a nice cold drizzle is pushing me in a different direction. A cold front blasted through last night, and it was in the high 30s this AM...sigh. As Jim Morrison sang, where will we be when the summer's gone? ...I can't tell you about! Couple of weeks, you guys (and guyettes) get to see everything...keep watching DOWN RANGE! Sounds like the end of one of those old science fiction movies, doesn't it? Keep watching the skies, America! The good news is, of course, is that FRED THOMPSON IS FINALLY RUNNING FOR PREZ! What a surprise...a Republican who actually believes in the Second Amendment! A Republican who doesn't consider the gun culture — that would be us — as either the loony uncle in the closet or, at best, an afterthought. I tried watching the Republican "debates," but with the exception of Ron Paul it looked like a bunch of dwarves in search of a Snow White. I wouldn't willingly choose one of those guys to change the oil in my car. 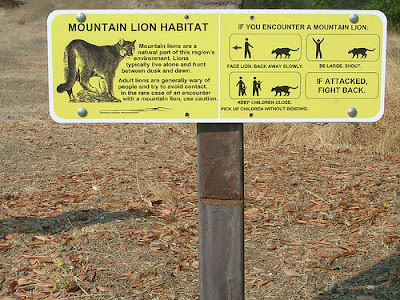 In news from my local "share the earth with all creatures great and small" crusade, earlier this week the lion that lives in my neighborhood took down an adult horse who was apparently trying to practice the live and let live philosophy so often espoused by Boulder County residents. The lion. of course, only wanted dinner, unfortunately far too close to my house! I figure a kitty kat who can bring down a big horse is a formidable animal, maybe a coupleof hundred pounds. Paging Mr. Casull! My deal still stands...I see it, I shoot it. Carl Bernosky took home top honors for the 8th time at the 2007 National Rifle Association High Power Rifle Championship Matches at Camp Perry, Ohio. Using an AR-15 platform rifle with a Smith & Wesson M&P15 lower, Bernosky achieved a first place finish and now becomes the first person in the history of the event to win the overall championship using an AR-15 platform rifle. 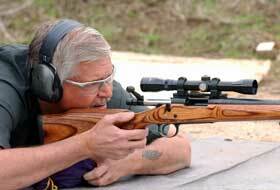 In addition, Bernosky also earned titles as the NRA Match Rifle Champion and Civilian Champion. Competing in the match for his 14th time, Bernosky decided upon using a Smith & Wesson M&P15 lower as the base platform for his custom high power rifle. A veteran of high power matches, Bernosky has amassed over 30 years of experience in competing and in building custom rifles. While Bernosky was not the only competitor in the field using an AR-15 platform, he earned the distinction as the first champion to use the AR-15 platform, finishing above second place shooter and former champion David Tubb. Is this where I get to say, "I told you so?" My pals at Brownell's are making a little history of their own. For the fist time, they're offering all their AR parts in a special catalog. You can get one by visiting Brownell's, but maybe you'd better sit on your credit card! "The handgun ban has saved countless lives, but this fundamental part of the District's public safety laws will be no more if the Supreme Court does not review and overturn this year's decision by the D.C. Circuit." Countless lives? D.C. is consistently at the top of the U.S. murder rate rankings. Was the gun ban saving "countless lives" in 1991, when the rate peaked at 80 murders per 100,000 people? Would the number have otherwise been even higher? Is it still saving "countless lives" when our murder rate for 2005, at its 20-year low, was still five times that of New York City? If I'm not mistaken, Fenty and Singer appear to be suggesting that their city is so totally lawless that only a total deprivation of Constitutional rights can make it moderately liveable. I wonder how they feel about wiretapping? Be sure to check out the new podcast on DOWN RANGE (or on the player above, natch)! Videos will be a day late because our video carrier chose last night to go down for maintenance...sorry! So I was out at the range in Clear Creek Friday — yes, the one I have to drive an hour to because of those big ole USFS "POSTED" signs! — where I was supposed to do a show-and-tell with my new production crew. Unfortunately, I had failed to factor in the hellish holiday Interstate traffic as the entire city of Denver trys desperately to get to the mountains, so I ended up at the range alone with a Honda Element-full of guns. Instead of doing what I usually do...50 rounds through this one; 100 rounds through that one...I hauled out the 1911 .45, the Kimber overhauled by Cylinder & Slide, and launched into a classic practical shooting set of drills — one-shot draws, two-shot draws, multiple targets, all at varying distances. I figured a 500-round practic session would be good for my return to USPSA Single Stack; then I discovered I only had 450 rounds of .45, but what the heck! I've been changing my foundation shooting style lately as a result of my recurring bouts with shingles effecting my right eye. Rather than whining about how I'm gettign old, which heaven knows I am, I've started making major changes in my shooting to reflect the new reality. For a start, I've gone back to a "hard," or classic Jeff Cooper, Weaver stance from the isoceles I've shot in competition for decades. The Weaver has accomplished two things for me...the gun is slightly closer (call it five inches) to my dominant, and weakened, right eye, making it easier for me to focus on the front sight, and the platform is rock stable, which allows me to run the .45 more aggressively. A side effect I hadn't anticipated is that hte locked-tight Weaver seems to take the heat off the elbows, which is a good thing. I'm also going back to shooting with my weak eye closed, which allows me to focus more clearly on the front sight...especially out of the Weaver! So anyhow, I was standing there shooting drills when I had a 25-year Flashback — what was I doding 25 years ago, 1982, as summer slid into fall? Well, darn it, I was doing exactly the same thing! Standing on a range with a 5-inch 1911 .45 ACP shooting drills getting ready for an IPSC match. I'd already changed from Rex the Wonder Gun, my first 1911 Combat Commader with S&W revolver sights, to an old Gold Cup a friend of mine had got right at a pawn shop he worked at. Of course, I'd quickly managed to shoot the pinned-in rear sight off and had scraped up enough money to have Bob Cogan at Accurate Plating & Weaponry do a trigger job, bevel the mag well, open up the ejection port a bit and put on a Bo-Mar rear sight, which looked weird on the Cup but shot just fine. That Gold Cup was one of the best-shooting 1911s I'[ve ever owned...Bob did an amazing job with it...wish I still had it! And NO, I didn't have a friggin' earring! ...like the Blade-Tech I was using yesterday, perhaps. But the B-T exactly mirrors the Davis/Taylor, if with a bit less style. Yesterday, strangely enough, I was using an old Rogers clip-on single magazine pouch that dates back to the mid-1980s...still works great, BTW. So, hell, what does that say about me? That I'm relatively consistent or simply boring? Maybe what it says that in the end, I would rather shoot a 1911 than any other gun in the world. After so many hundreds of thousands of rounds over so many years, my hands "recognize" the 1911, and there's something comforting about it. That's what I think USPSA is being extremely smart in sanctioning Single Stack competition on a formal basis...it's still the most popular gun in the world...especially with old farts like me! PS: When I finished my 450 rounds of .45 ball, I ran a couple of hundred rounds (.44 Special Cowboy stuff; 240-gr @ 750fps) through the Ruger 4-inch Redhawk I'm going to use in the GUNSITE revolver class in a couple of weeks. SWEET! Yeah, it's a Ruger trigger, but it's smooth. Gonna work GREAT for the class!